What is the Ideal Fridge Temperature? Getting the fridge temperature right in your home is important for a few reasons. The temperature of fridges in the UK is a contributing factor towards food waste and getting the correct temperature for your fridge down will help you to keep your food as fresh and tasty as possible. Another reason for ensuring you’ve set a safe fridge temperature is that you can potentially cause yourself illness if yours is wrong. You can’t spot harmful bacteria when it appears so you may end up causing yourself issues. Different foods thrive at different temperatures in a household refrigerator, too. Getting to grips with these differences and unique properties of the food you love to eat will enhance the storage, quality and taste of your ingredients. What Temperature Should Your Fridge Be? The average temperature of fridges in the UK is 7 degrees centigrade. However, the optimum temperature for your fridge is between 0 and 5 degrees. Now, you may think that your fridge is already set to that temperature as some don’t even offer you the ability to go over 5 degrees but setting your fridge temperature in between these values doesn’t necessarily mean that your fridge is actually at that temperature. 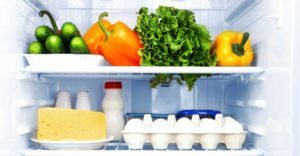 Your fridge won’t account for the heat generated by the unit itself and other factors that might cause the temperature inside it to be a couple degrees above the optimum fridge temperature. If you want to accurately measure the temperature of your fridge unit, grab a thermometer and follow these really easy steps. Fill up a glass of water and place it in your fridge. Bear in mind that the temperature varies around your fridge so don’t place it in a crisper drawer or in a door shelf to ensure an accurate read. Put a thermometer in the glass of water and leave it overnight. The first time the fridge door is opened that day, check the temperature on the thermometer. This will give you an accurate read of your fridge temperature and then you can adjust accordingly. There are some steps that you can take to ensure that your fridge keeps running at the correct temperature. The fuller your household refrigerator is, the more consistent the temperature will be. This will in turn reduce the amount of energy your fridge uses. Don’t completely fill it to the brim though. This will reduce the airflow and negatively impact your fridge’s efficiency. Not all foods were created equal. Some need different temperatures in which to thrive. For example, foods that are prone to spoiling like eggs, butter and milk shouldn’t go in the door compartments. These are exposed to room temperature the most whenever the fridge door is opened, so will experience fluctuations in temperature. If your fridge door has a sealed compartment in it, you might be okay, but it’s still better to store it elsewhere. Keep dairy products high in the fridge and raw meat on the lowest shelf. This isn’t just for temperature reasons, but also to prevent any runaway juices tainting your other foods. 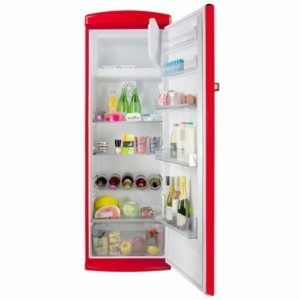 The fridge door is for things like condiments (ketchup, mayo etc) and drinks you want to keep cool like fruit juice etc. Sometimes though, the problem lies with your fridge itself. If your fridge has seen better days and you think you could do with a more modern, reliable unit then head to the fridges range in our refrigeration section. You’ll find fridges alongside our freezers, fridge freezers and our outstanding range of American-Style fridge freezers. With loads more lines of appliances to shop from, see how much you can save at Appliance City today!